It's the final countdown to the arrival of our littlest head. Plenty to do in a little over a month. Let's go back to July 4th weekend, where the Big news was revealed to the Big Brother (and everyone else for that matter). We were attending a Maryland Blue Crabs baseball game, and thought it would be a fun way to let the Littlehead know that he wasn't going to be the only littlehead in the family anymore. Obviously, it was a bit of a shocker. But we had more people to share the news with. How to do it? Well, good thing Mommy designs shirts for such an occasion. We had to improvise since it would have taken too long to order a real shirt from my Cafe Press shop, but it worked great. 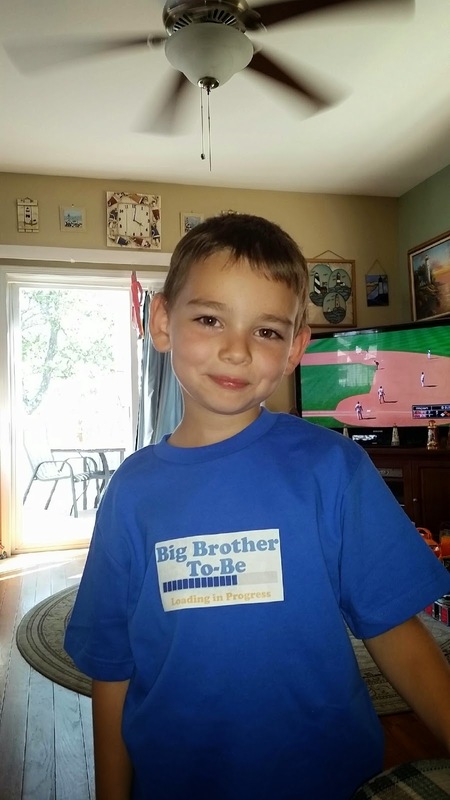 Littlehead walked into Mimi and Poppy's with the shirt on, and didn't say a word until someone actually read the shirt (which says "Big Brother To-Be : Loading in Progress"). Lot's of excitement ensued. When it was time to find out if it was a Baby Mickey or Baby Minnie, we decided to involve the Big Brother in the reveal! He was at school while mom and dad were at the doctor's getting the results. It's another BOY for the Goldman family! Good thing we've held on to all if little head's clothes and such. We just have to supplement a few things since the littlest head will be born in the winter instead of the summer. Now it's January, and it's a little less than a month before the little guy is due to arrive. (Well, due is a little different in this case as it will be a scheduled C-Section). And there's plenty to do. The lists have started...so has the nesting it seems as I have just spent the past few days tackling some organization in the kitchen. One big thing on my mind lately... Cloth diapers. Now, big brother was a solely disposable diaper baby, until the cloth training pants stage. Now...I have quite a few friends who are experienced cloth diapers, and I have hit them up for suggestions and advice. I've also done research via Pinterest. I found a decent sale on Zulily on FuzziBunz,and ordered a few. Just waiting for them to arrive. I also found a local gal who runs a cloth diaper business from her home. A shout out to Tiffany at FiggyFuzz for letting me stop by and explaining all things cloth diapering. It was very helpful to see and touch all the varieties of cloth diapers. From pre-folds, to pockets, to all-in-ones.... it actually really all started to make sense. So, this is the beginning of this new endeavor. I hope to keep sharing as I learn more about cloth diapers and how they work or don't work for us and the littlesthead.